Once upon a time I worked in The Mall. It was a lovely Mall with nice shops and pretty fountains and ample parking. The Mall had no Dark and Scary Food Court... instead it had real, sit down restaurants. Lovely for guests of The Mall, kind of a hassle for workers of The Mall. I usually had a giant coffee and spent the rest of my lunch hour shopping in The Mall. It was not a profitable time in my life, but man I had some cute stuff. Anyway, long tale short, there was a California Pizza Kitchen in The Mall and when I actually ate lunch, I ALWAYS ordered the Chicken Tequila Fettuccine. This is a pretty involved recipe for me... there is a bit of prep work, and a few steps, but the end result is totally worth it when you want a decedent, totally comforting meal. And despite the list of ingredients, this doesn't taste boozy, or spicy, or even like some sort of Latin/Italian fusion. It's creamy, tangy, and flavorful. It's so good. 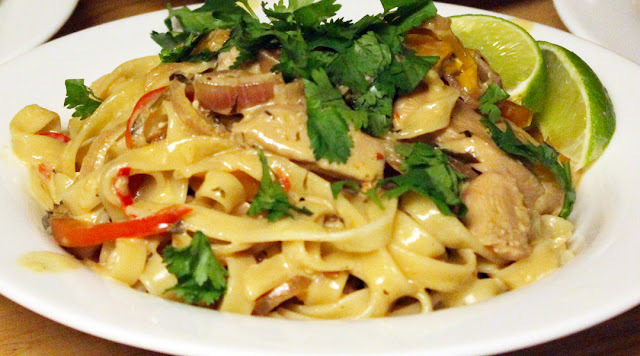 Chicken Tequila Fettuccine - adapted from California Pizza Kitchen and several Google searches. Serves 4 a hearty main meal. I found this recipe works best with a lot of prep done ahead of time. Chop cilantro, garlic, chili, bell peppers, and set aside. Measure out stock, tequila and lime juice. Cut up chicken and start it marinating in soy sauce. In 2 tablespoons of butter, cook garlic, cilantro and chili until garlic is a bit toasted and cilantro is wilted - about 3 minutes. Add in tequila and stock. Use a big pan - this is where all of the food is going to end up. I used a 12" cast iron skillet. 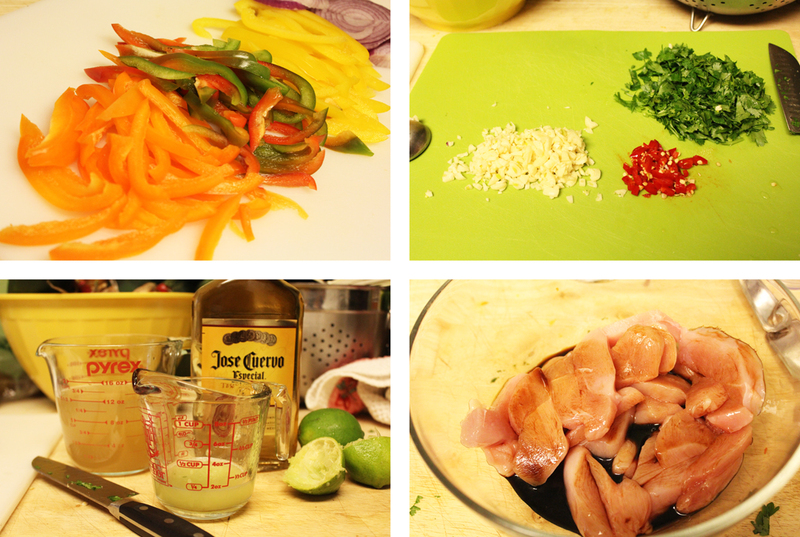 Once tequila and stock are cooking, let this mixture simmer and reduce while you go about the rest of the cooking. Start the water for the pasta. In a second skillet, cook bell peppers and onions in the remaining tablespoon of butter. Once veggies are softened, add the chicken in all of the soy sauce. Cook chicken a bit and then add everything to the stock mixture. Poor in the cream and let the chicken cook through while the cream sauce thickens - about 10 minutes. Let the pasta cook at this time. Once the chicken is cooked through and the pasta is cooked to your liking, drain the pasta, reserving 1 cup of starchy water. Toss all of the pasta with the chicken and cream sauce. If it seems too thick, add some of the pasta water. 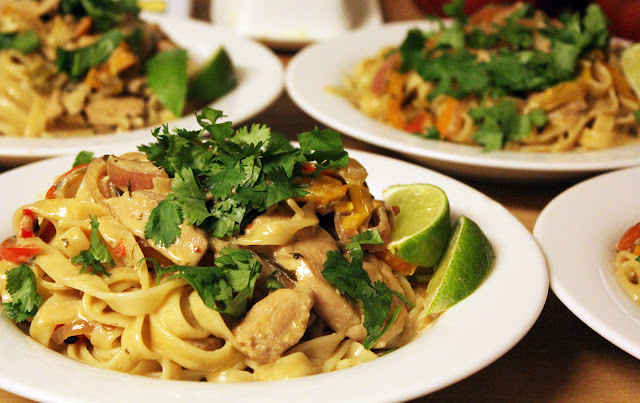 Divide pasta, chicken and veggies into 4 bowls. Top with more chopped cilantro and serve with slices of lime.